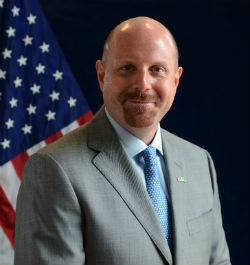 Brian Heath assumed charge as the U.S. Consul General in Karachi on August 20, 2014. A career member of the Senior Foreign Service, Mr. Heath most recently served as the Minister-Counselor for Management Affairs at the U.S. Mission to the United Nations in New York. Since joining the Foreign Service in 1998, Mr. Heath’s overseas assignments have included Director of the U.S. Regional Embassy Office in Al Hillah, Iraq; Consul General at the U.S. Consulate in Lahore, Pakistan; Management Officer at the U.S. Consulate General in Karachi, Pakistan; General Services and Human Resources officers at the U.S. Embassy in Berlin, Germany; and Consular Officer at the U.S. Consulate General in Mumbai (Bombay), India. In the course of several assignments in Washington, DC, Mr. Heath has studied at the National War College; worked as a Senior Advisor in the Under Secretary of State for Management’s Office of Management Policy; and served as a Special Assistant to the Assistant Secretary of State for Administration. Mr. Heath is the recipient of multiple Department of State Superior and Meritorious honor awards. Mr. Heath graduated from Fordham University with a Bachelor’s degree in political economics, earned a law degree from Rutgers University, and received his Master’s degree in national security studies from the National War College. He is a member of the New Jersey and New York State bars.